During the American Civil War many family members fought alongside one another, and it is believed that at least fifteen members of the McCook family of Ohio fought in the war. Daniel McCook, eight of his sons, his brother John McCook, and his five sons fought for the Union. During the American Civil War many family members fought alongside one another, and it is believed that at least fifteen members of the McCook family of Ohio fought in the war. Daniel McCook, eight of his sons, his brother John McCook, and his five sons fought for the Union. The two families were known individually as the Tribe of Dan and the Tribe of John but together were known as the “Fighting McCooks”. Before the Civil War, Daniel McCook lived in Carrollton, Ohio, about thirty miles away from present day Canton. The Tribe of Dan included the father and his eight sons: Latimer, George, Robert, Alexander, Daniel, Jr., Edwin Stanton, Charles Morris, and John James. Sadly, only four members of the Tribe of Dan survived the war. The first McCook to die in the war was Charles Morris. The wounds that he received in the First Battle of Bull Run were too great to survive. The patriarch was commissioned as a major and died in the Battle of Buffington Island, the only major battle to occur in Ohio. George served as an Ohio attorney general before the war and was commissioned as a brigadier-general when he entered the service. His two brothers Robert and Daniel Jr. were also brigadier-generals, and both died in combat. Robert was killed in Tennessee and Daniel Jr. in the 1864 Battle of Kennesaw Mountain. Additionally, in 1862, Latimer, a major, was in Tennessee lying wounded in an ambulance when Confederate guerrillas murdered him. Both Alexander and Edwin were major generals and survived the war, even though the latter received severe wounds three times. 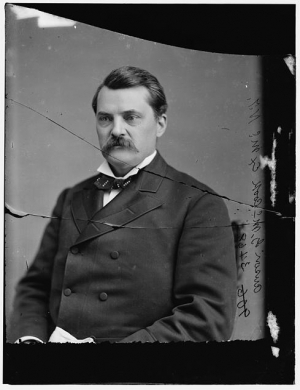 After the war, Edwin became governor of the North Dakota Territory and was eventually assassinated. John James was the only Fighting McCook to have the rank of colonel. He survived the war. John McCook of the Tribe of John was a doctor in Steubenville, Ohio. He continued his medical career in the war, volunteering as a surgeon. He and his sons Edward, Henry, John James, Anson, and Roderick all survived the war. Edward and Anson were major generals, while Roderick became a United States Navy commander. Henry and John James were commissioned lieutenants, serving as chaplains in the Union Army. The McCook family gained notoriety in the North for their dedication and sacrifice to the nation and to the Union war effort. Five of the Fighting McCooks died in service, and fourteen became officers. Anson George McCook (October 10, 1835 – December 30, 1917) was a brevet brigadier general in the Union Army during the American Civil War, attorney, and three-term postbellum U.S. Congressman from New York. He was a member of the “Fighting McCooks,” one of America’s most prolific military families during the Civil War.